Those of us who teach a standard course in environmental economics are obligated to cover the basic tools of economic analysis and show how these tools are applied to environmental issues. These include marginal analysis, discounting, competitive equilibrium and market failure. But the limitations of neoclassical analysis as applied to the major global environmental issues we face, biodiversity loss and climate change, are becoming increasingly obvious. What can ecological economics bring to the table? The basic insight of ecological economics is that the economy is embodied within the biophysical world and human social institutions. This simple observation has some major implications for teaching environmental economics. Most importantly it changes the analytical boundaries of the subject matter of economics. 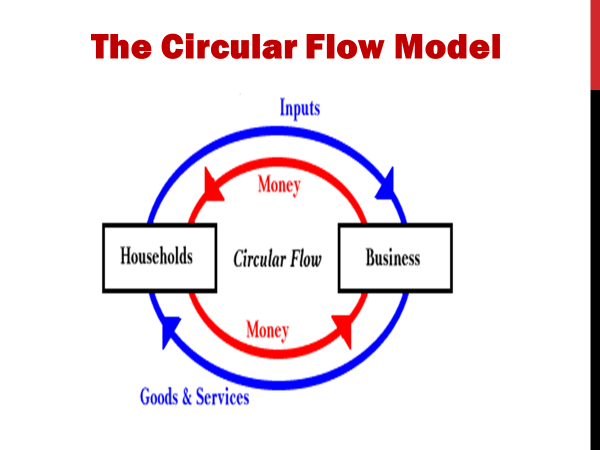 In the second half of the twentieth century the scope of economics was narrowed to “the science of the allocation of scarce resources among alternative ends.” The economy was conceptualized as a circular flow between producers and consumers. What goes on outside the boundary of the circular flow—where the inputs into the economy came from or where the waste from the economic process went—was considered to be outside the purview of economics. By itself, there is nothing wrong with this framework. As Nicholas Georgescu-Roegen (1979) pointed out, to describe any process analytically one must clearly delineate the boundaries of the analysis. Any boundary is to some extent arbitrary. But by the 1960s and 1970s it was clear that restricting the whole field of economics to the interaction between households and firms had serious limitations. As affluence grew after WWII so did environmental pollution. It became clear that pollution was not merely an externality but was an integral part of the economic process. The 1970s brought a series of energy price shocks that focused attention on finite nature of resources supporting economic activity. Two pioneering economists, Nicholas Georgescu-Roegen (1971) and Kenneth Boulding (1966) saw the need for an expanded analytical framework and laid the groundwork for the field of ecological economics. The person most responsible for establishing ecological economics as a serious alternative to neoclassical theory was Georgescu’s student, Herman Daly, who published two seminal books in the 1970s that solidified ecological economics as a legitimate field of study distinct from neoclassical economics. The basic insight Daly brought to the table is that all economic activity requires primary resources from nature and that these resources end up as waste at the end of the economic process. 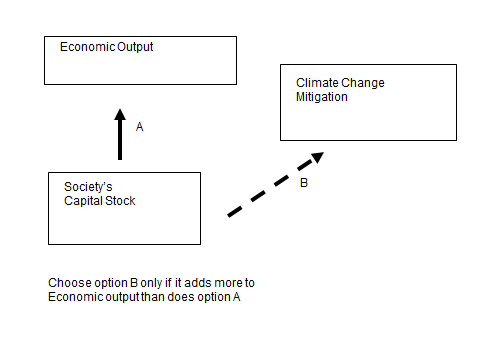 Casting economic activity as a one-way flow as depicted above accomplishes two things: (1) it shows that the scope of neoclassical economic theory is limited to resource allocation by markets, and (2) it extends the scope of environmental economic analysis beyond market-based resource allocation. Let standard theory have its field of study and let it develop its tools to study market exchange. But recognize the need for other analytical tools to deal with intergenerational choice, irreversible pollution, the exhaustion of irreplaceable resources, and the importance of collective choices and ethics. 1. The importance of a long-term perspective on the place of humans in the natural world and the place of the market economy in human history. A long-term evolutionary view of the human economy and economic change is essential to understand the current problems we face. Homo sapiens has been on planet earth for something like 200,000 years. For more than 95% of this time we lived as hunter-gatherers with no agriculture, no settled communities and no hierarchical social structure. Market economies represent a tiny fraction of human history. Evolution is a key to understanding how the economy works and a key to sound economic policy. Standard economics sees economic change as static constrained optimization, the efficient allocation of scarce resources among alternative ends. It implicitly embraces a survival-of-the-fittest view of market outcomes based solely on competition and individual-based selection. Ecological economics stresses the importance of contingency, historical accidents, path dependency, and cooperation for the collective good. Altruism and group selection are at least as important as selfishness and individual fitness. Human nature is not universal. Human behavior and human values vary enormously among cultures and time periods. This is an obvious point but most students (and most economics professors) really don’t get the point. The question of human nature is critical because the answer to the question “What is human nature”? is essential to answer the question “What is the best public policy”? If we assume that people are materialistic self-referential utility maximizers then all that policy makers need to do is make sure property rights are fully assigned and enforced and that prices reflect all external effects. If our view of behavior is more realistic then things like fairness, relative income, and the importance of cooperation must be taken into account. Bruce Wexler. 2006. Brain and Culture: Neurobiology, Ideology, and Social Change. Cambridge, MA: MIT Press. This book documents the evidence for human brain plasticity. Most neurons in the human brain are formed after birth, and brain structure is influenced by environmental conditions including culture. Henrich, J., Boyd, R., Bowles, S., Camerer, C., Fehr, E., Gintis, H., McElreath, R., 2001. “In search of Homo economicus: Behavioral experiments in 15 small-scale societies.” American Economic Review 91, 73-78. This important paper reports results from playing the ultimatum game among 15 very different small scale societies. Both offers and acceptance rates vary greatly among culture depending on the economic structure of those societies and the associated social values. 2. How unique are the cultural values of market societies? Henrich, J., S. Heine, and A. Norenzayan. 2010. Behavioral and Brain Sciences 33, 61-135. Abstract – Behavioral scientists routinely publish broad claims about human psychology and behavior in the world’s top journals based on samples drawn entirely from Western, Educated, Industrialized, Rich, and Democratic (WEIRD) societies. Researchers – often implicitly – assume that either there is little variation across human populations, or that these “standard subjects” are as representative of the species as any other population. Are these assumptions justified? Here, our review of the comparative database from across the behavioral sciences suggests both that there is substantial variability in experimental results across populations and that WEIRD subjects are particularly unusual compared with the rest of the species – frequent outliers. The domains reviewed include visual perception, fairness, cooperation, spatial reasoning, categorization and inferential induction, moral reasoning, reasoning styles, self-concepts and related motivations, and the heritability of IQ. The findings suggest that members of WEIRD societies, including young children, are among the least representative populations one could find for generalizing about humans. 2. The basic neoclassical model of neoclassical general equilibrium theory. Students need to know where this theory came from, its underlying assumptions, and how it works as a unified system of thought. The field of economics is changing rapidly but it is still dominated by general equilibrium theory. This all-encompassing analytical framework is the bread and butter of modern economics. It is responsible for the dominance of economics among the social sciences and is the main reason for the “superiority” of economics in current political discourse. Fourcade, Ollion and Algan (2015) documented the insularity and hierarchical structure of the economics profession compared to all the other social sciences. One may lament the privileged position of standard economic theory, but that privileged position makes it absolutely essential for critics to be thoroughly versed in the mathematical and logical structure of Walrasian general equilibrium theory. The starting point of the Walrasian system is the exchange of a fixed collection of goods among individuals bartering directly with one another. The end result of free and voluntary exchange is that no further trading will make one person better off without making someone else worse off. This result is called Pareto efficiency and it establishes one of the key ideas in modern economics, namely the welfare benefits of market exchange. The next step is to introduce prices into the basic model to show that a perfectly operating market economy will duplicate the results of face-to-face bartering. This is called the First Fundamental Theorem of Welfare Economics and it establishes the theoretical justification for the alleged superiority of the market as the fundamental organizing institution of modern human society. This is the ideological purpose of neoclassical theory and why economics holds such a powerful position in contemporary society. The Second Fundamental Theorem of Welfare Economics recognizes that prices may be “imperfect” but that it is possible for enlightened intervention to correct these market failures and re-establish the conditions for Pareto efficiency. Most of contemporary environmental economics is grounded in the Second Fundamental Theorem. Environmental problems are characterized as negative externalities that can be eliminated by determining the proper values of nature’s services so that they can be correctly priced and efficiently allocated by rational consumers and producers. Daniel Bromley 1990. “The Ideology of Efficiency: Searching for Theory of Policy Analysis. Journal of Environmental Economics and Management 18, 96-107. This classic paper cuts to the heart of neoclassical analysis by challenging the notion of “efficiency” as a scientific concept and a universal basis of public policy. Bromley argues that efficiency is just one of many possible subjective goals of public policy. John Gowdy, Richard Howarth and Clem Tisdell. 2010. “Discounting, Ethics, and Options for Maintaining Biodiversity and Ecosystem Services.” Chapter Six in The Economics of Ecosystems and Biodiversity: Ecological and Economic Foundations. Pushpam Kumar (ed.). An output of TEEB: The Economics of Ecosystems and Biodiversity. London: Earthscan, 257-283. Discounting the future is perhaps the most critical issue in environmental valuation. Estimates of future costs and benefits are driven by the choice of the discount rate. There is no scientific way to pick a discount rate. Consumer Theory – Behavioral economics and neuroeconomics have challenged the axioms of consumer choice and opened up the public policy discussion. The behavioral critiques are different because they put the economic assumptions about decision making on an experimental footing. They show that the neoclassical model of human behavior makes poor predictions, but they also show that consistent patterns show up within particular cultures. If you know the cultural mores of a particular society you can make reasonably good predictions of behavior in that society. Knowing whether a person is British, Israeli, or Hadza1 allow us to make better predictions than knowing individual characteristics such as gender, age, or income. Neuroscience informs behavioral economics by validating behavioral experiments and deepening our understanding of the regularities discovered by these experiments. It can help identify what’s missing from standard economics including the role of automatic and emotional processing in decision making, and how the brain nuances aspects of decision-making like discounting the future. The structure of the human brain shows the evolution of the “sociality” of the human species. Production Theory – The foundation for general equilibrium theory is utility theory—how a consumer allocates her limited income among alternative commodities. This model was merely transferred from consumption to production. The “neoclassical theory of production” is at bottom just a theory of the efficient allocation of a fixed collection of inputs among alternative production possibilities. There is no appreciation of production as a physical system requiring the transformation of nature–including human labor power–into commodities. The current revolution in economics has focused on the consumer or “utility” side—behavioral economics, game theory, decision science, neuroeconomics—where does human behavior originate? But very little work has been done on “where do productive inputs come from?” Developing realistic models of economic production including the role of inputs from nature, human institutions, and human labor is one of the greatest challenges facing economists today. Georgescu-Roegen laid the foundation for a scientific basis for production theory in The Entropy Law and the Economic Process, by taking the Second Law of Thermodynamics, the entropy law, as the starting point for economic analysis. Humans, like other living things, survive by extracting low entropy from the environment. In contrast to other species, humans in industrial societies do not live primarily by using the flow of solar energy but rather by drawing down the stocks of sunlight stored in fossil fuels. Progress in the economics of production has proved to be much more elusive than in analyzing economic decision making. The greatest strides have been made in extending input-output analysis by natural resource accounts. Much of this work has been done by the World Bank and the United Nations Environment Program. An ambitious effort to operationalize Georgescu-Roegen’s production model is the work of Mario Giampietro and Kozo Mayumi. The first textbook on “biophysical economics” was published in 2011 by Charles Hall and Kent Klitgaard. Mario Giampietro and Kozo Mayumi. 2014. The Metabolic Patterns of Societies: Where Economics Falls Short. Routledge. Charles Hall and Kent Klitgaard. 2011. Energy and the Wealth of Nations: Understanding Biophysical Economics. Springer. 4. Climate change is the premier environmental problem illustrating all the ecological economic concepts discussed above. The necessity of a long view of the place of humans in the natural world. The diagram below shows the earth’s average temperature (blue), the level of atmospheric CO2 and the amount of dust particles in the atmosphere (red). Several things are apparent in this diagram (1) during human history before the Holocene temperatures were almost always much lower and their fluctuations much greater, (2) the Holocene (the last 10,000 years) has been unusually warm and stable, (3) there is a tight correlation between temperature and CO2 levels, and (4) after fluctuating between 200ppm and 280ppm for 400,000 years, CO2 levels jumped by 100ppm in less than 100 years. 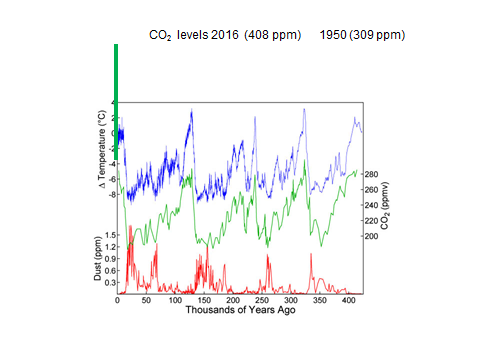 With this diagram it is easy to see the importance of carbon in the climate change debate, the uniqueness of the Holocene in human history, and the almost unbelievable impact of humans on the global atmosphere in just a few decades. Discounting and the individual at a point in time perspective of neoclassical theory. The Ramsey equation is a representation of inter-generational choice in the neoclassical general equilibrium framework. Working through the terms in the equation is an exercise in highlighting what really counts in the economics of climate change. Pure time preference (δ) indicates the responsibility of the present for the well-being of future generations, the elasticity of consumption (η) is a measure of how well-being increases with more income, and gt is an indicator of how well off we think people in the future will be (gt could be subjective well-being instead of income). Benefit-cost Analysis.” Natural Resources Journal 48, 53-90. General equilibrium analysis assumes that a stable climate is just another “good” subject for monetary calculation and substitutions. In this framework, the purpose of economic activity is to use society’s scarce resources (capital, labor, natural resources, and technology) to maximize the net present value of the output of consumption goods through time. When applied to climate change, the policy question becomes “When is it justified to divert resources from the production of consumption goods in order to mitigate the effects of climate change?” The answer is “When the economic damages caused by climate change are greater than the costs of climate change mitigation.” This is illustrated in the figure below. In the neoclassical framework policies to curb climate change are justified only when the discounted value of the flow of consumption goods is increased by climate change mitigation. A discussion of ecological economics would be incomplete without mentioning the debate among ecological economists between those who strongly favor market solutions to environmental problems and those who see the global market economy as the source of environmental and social unsustainability. Costanza, Robert et al. 1997. “The Value of the World’s Ecosystem Services and Natural Capital.” Nature 387, 253-260. It is one of the most cited papers ever and its approach has dominated the research agenda of ecological economics since its publication. Costanza, Daly and other ecological economists have made pioneering contributions analyzing the contradiction between an ever-growing economy and a healthy environment. But many ecological economists argue that monetizing nature as a means to rationally allocate nature’s services accepts the worldview that nature exists only to support economic output. The term “natural capital” makes this explicit. Anderson, B., M’Gonigle, M. 2012. “Does ecological economics have a future? Contradiction and reinvention in the age of climate change.” Ecological Economics 84, 37-48. Baveye, P., J. Baveye, J. Gowdy. 2013. “Monetary evaluation of ecosystem services: Getting the timeline right.” Ecological Economics 95, 231-235. Blauwhof, F. 2011. “Overcoming accumulation: Is a capitalist steady-state economy possible?” Ecological Economics 84, 254-61. Duroy, Q. 2017. “Hyper-individualism and ultrasociality in a Veblenian framework.” Ecological Economics 131, 538-542. Fletcher, R., Büscher, B., 2017. “The PES conceit: Revisiting the relationship between payments for environmental services and neoliberal conservation.” Ecological Economics 132, 224-231. Gómez-Baggerthun, E, Muradian, R., 2015. “In markets we trust? : Setting the boundaries of market-based instruments in ecosystem governance.” Ecological Economics 117, 217-224. Kosoy, N., Corbera, E., 2010. “Payments for ecosystem services as commodity fetishism.” Ecological Economics 69, 1228-1236. Nadeau, R.L., 2015. “The unfinished journey of ecological economics.” Ecological Economics 109, 101-108. Pirgmaier, E., 2017. “The neoclassical Trojan Horse of steady-state economics.” Ecological Economics 133, 52-61. Daly, Herman. 1977. Steady State Economics Washington, DC: Island Press. Fourcade, Marion, Etienne Ollion and Yann Algan. 2015. “The Superiority of Economics.” The Journal of Economic Perspectives 29, 89-113. Georgescu-Roegen, Nicholas. 1979 “Methods in Economic Science.” Journal of Economic Issues XIII(2): 317-328. Georgescu-Roegen, Nicholas. 1971. The Entropy Law and the Economic Process. Cambridge, MA: Harvard University Press. Gowdy, John. 2010. Microeconomic Theory Old and New: A Student’s Guide. Stanford, CA: Stanford University Press. Gowdy, John. 2008. “Behavioral Economics and Climate Change Policy.” Journal of Economic Behavior and Organization 68, 632-644. Gowdy, John. 2004. “The Revolution in Welfare Economics and its Implications for Environmental Valuation.” Land Economics, 239-257. Gowdy, John. 2000. “Terms and Concepts in Ecological Economics” Wildlife Society Bulletin, 28, 26-33. Gowdy, John and Jon Erickson. 2005. “The Approach of Ecological Economics” Cambridge Journal of Economics 29, 207-222. Parks, Sarah and John Gowdy. 2013. What Have Economists Learned about Valuing Nature? A Review Article.” Ecosystem Services 3, 3-12. Wilson, David Sloan and John Gowdy. 2013. “Evolution as a General Theoretical Framework for Economics and Public Policy.” Journal of Economic Behavior and Organization 90S, S3-S10. 1 The Hazda are an indigenous ethnic group in Tanzania.